These perks she is talking about seem to be the ones found in other Middle Eastern countries. Only the citizens are allowed to enjoy them. But here ISIS is pretty much giving them away like home grown oranges to those who convert through them. 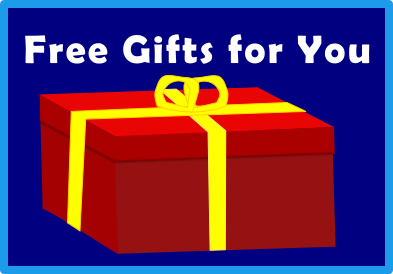 This formula of luring people into a religion is not at all new. It has been cooked to perfection by some Christian missionaries. Ironically, Indian Muslims and Christians are experiencing something similar. It is about convenient lifestyle in exchange for religion. But none is anywhere near the extravagant perks of ISIS and that should make us all worried. The post of the female above elucidates why the terrorists are unable to see their wrongdoings. Their version of Islam is equal to those perks. It is useless to tell them about democracy, for in such system, we are required to pay taxes from a wide variety of sources. In their calculation, that is oppression. The free houses she is boasting about probably are those left behind by the Syrian refugees. She is not paying rent because she is in a war-torn location. It would be unlikely for some terrorist to play property manager over there. The scheme of free electricity and water does not guarantee safety. There is a reason why in normal countries, people are billed for them. The unfortunate truth is that American tax money is responsible for the so called free electricity she is enjoying. 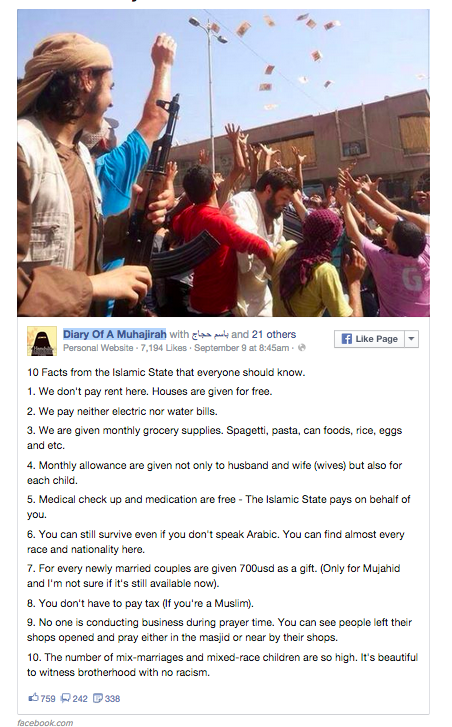 Free groceries are the result of ISIS not being able to freely run a legitimate economy. Monthly allowance is an incentive to keep the terrorists fighting. Free healthcare does not guarantee quality especially in a war-torn location. What she is hiding is that queen sized treatment is reserved mainly for the terrorists. Many of them now carry a flesh eating disease. Moreover, they don't have access to vaccines. Polio has resurfaced in the country. Diversity is a normal thing found in many countries. Lots of people survive in Middle East without knowing Arabic. $700 reward is being used to encourage the terrorists to make terrorist babies. ISIS knows quite well it has no future for which it sees nothing wrong in using children as their fighters. Although their religion forbids tax it would be difficult to convince anyone to fight and pay it at the same time. Who will go collect it anyways? Closing all shops at the time of prayer is not possible in a normal economy. Racism does exist among ISIS terrorists. They are notorious for creating fake suicide attacks just to get rid of their South Asian and certain African fighters. These people are considered uninvited and inferior. Bad news is that in the Arab world, European physique is admired and thus, the young western people are at risk of being recruited. Remember that if ISIS had any good intention there would have been no massacre.However, it is not uncommon for people to overlook atrocity for the sake of good life. Think about gangs. People choose to become their members to have a meaty lifestyle. Then think about the college fraternities. Just like the woman above, they speak of brotherhood while offering heavenly homes, parties and many other benefits for the new graduates. 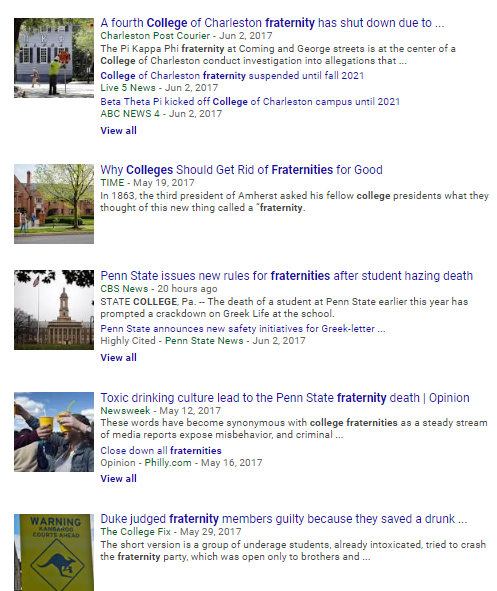 But if you just Google the keyword college fraternity everyday you will keep seeing new reports of assaults and other gruesome incidents linked to at least one of them. Yet these fraternities are never without members. It is the same thing with ISIS. We can't underestimate the advertisement beneath which breathes the sinister alley. Some, even after being aware of brutality do not mind supporting its sender. The election already showed we have citizens in the country who lean towards the kind of ideology ISIS stands for. Just look at the Trump supporters. They have no problem in accepting the ideology of this terrorist organization as long as it does not come with the Islamism label. 'Can we not kill them all?' asked another in a meeting at North Carolina. The question was about Muslims. 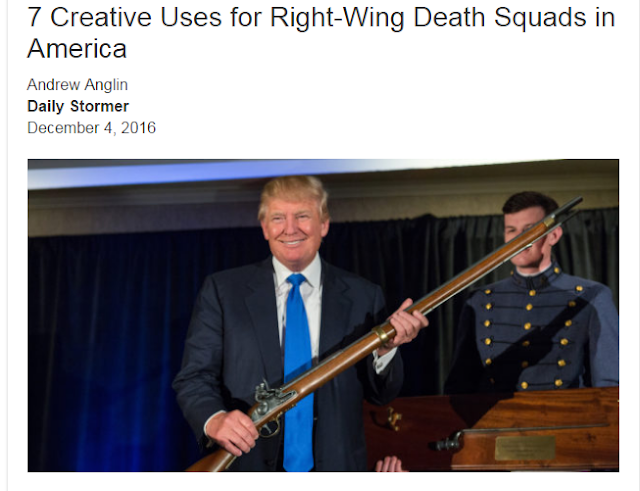 Let's not forget that we are also seeing constant threats of civil war from them. In the middle of all this, they reveal that we still have people in the country who support violence and oppression for the sake of self interest. Its nice that they don't have the privilege to get weapons like ISIS. Otherwise, millions among us would be have been dead long time ago. That said, in no way, the so called Islamic state will ever turn into a real country. It's only a matter of time before they are turned into dust by the western military. And even before that, change in the state religion of theirs may become necessary. The title they will have to settle for is Atheistic State. It is just that the average residents who got stuck in their locations are now turning to atheism. Joking apart, don't underestimate the perks and the brotherhood ISIS speak of. We have many Americans not doing fine. Economic recovery is still going slow. Not all new graduates are able to jump start their careers in one go. Wage has dramatically gone down in many professions.Some people are lonely and depressed. ISIS recruiters usually target that kind of group. So when someone needs to be open about their sorrow listen to them. Help them look at things clearly. Be a support for them before ISIS makes the same move.